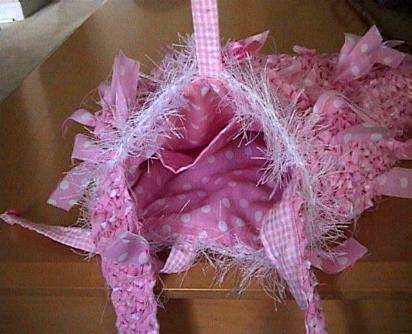 This is a Beautiful fancy newly made pink and white purse/rag bag that I handknitted myself. It is 10 inches high, 10 inches wide and 2 1/2 inches deep on the sides. The strap is 28 1/2 inches total. The back does not have the frilly look-it is solid knitted. The fabric is a good quality cotton/poly blend. You will enjoy being seen with this purse as much as I enjoyed making it. Gorgeous eyelash fur yarn highlights the top of this purse. A nice sized pocket is inside. The inside of the strap is lined with matching fabric. No worry about stretching. It is lined with the pretty matching fabric. The purse closes with 2 ties embellished with 2 matching buttons.